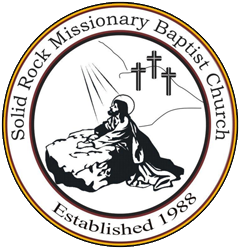 Solid Rock Missionary Baptist Church was established December 16, 1988 by the late founder and Pastor Rev. Eugene Dew where he held the first service in the basement of his home at 4101 West Palo Verde Drive, Phoenix, Arizona. Solid Rock membership grew in 1989 after moving to a store front located at 43rd Avenue and Missouri. A food share program was added to serve the needy in the community bringing great blessings to the church in many ways. In 1994 after Pastor Dew's departure, Deacon and Mrs. Charles Fletcher asked Rev. Lee Montague, from Luke Gospel Service at Luke Air Force Base, to help with the service and he eventually became the pastor of Solid Rock, which began to grow again. After moving to a new location at 4444 South Third Street in 1995, Pastor Montague developed many ministries - including bible study for youth, adults, male and female, vacation bible classes, computer classes and children's education. In the year 2000 Pastor Montague became Pastor Emeritus until Rev. Gregory Chambliss was elected as pastor in 2001. After selling the South Phoenix property, from 2001 to 2003 Solid Rock worshipped in an auditorium at Desert Horizon School located at 8525 West Osborn Road, Phoenix Arizona. From 2004 to 2009 Solid Rock occupied a facility at 8607 North 59th Ave, Glendale, Arizona; but due to facility not being up to code Solid Rock decided to move in 2009 to its present location located at 9516 West Peoria Avenue, Peoria, Arizona. Since moving to the Peoria facility under Pastor Chambliss's leadership, Solid Rock has Worship Service every Sunday, Sunday school, and Bible Study twice a week. We also offer food boxes, food and clothing ministry, liberal and young adults ministry, youth ministries, prayer shawl ministry, gifts ministry for youth, back to school program, and more. Pastor Chambliss focus has been on restoration by establishing and reorganizing the Leadership Team and by adding a new, separate Trustee Board. A Prayer Ministry was also started and the group meets every Saturday morning at Solid Rock. For the 2016 year, Pastor Chambliss new vision was "Emancipating and Restoring Lives for the Kingdom for the people to know of the Holy Spirit". In 2018 we looked forward to a new vision set forth by Pastor Chambliss in the hope that it will guide us to reach this objective,"Loving God, Loving People, Making A Positive Difference," Zephaniah 3:17, 1 John 4:18-19, 1 Peter 4:8. May of 2018 God open the door for Solid Rock to purchase the property at 8412 W Washington St in Peoria Arizona. The theme for this project was called "The Harvest Project" with Solid Rock holding its Ribbon Cutting Ceremony and officially opening on June 10, 2018. The house was in overflow with the glorious presence of God. 2019 God continues the theme of 2018 with emphases on Love celebrating our 31st Anniversary as we claim this to be our 1st Anniversary for overflow. We look forward to making Love a priority over the next decade, giving thanks to God and doing everything to expand His Kingdom and to bring Glory to His Name.